Obama: Yankees "Easy to Love" and "Easy to Hate"
President Obama honored the 2009 World Series champion New York Yankees at the White House today, calling the team both "easy to love" and "easy to hate" because of their attitude and success. "It's been nine years since your last title, which must have been an eternity for Yankees fans," the president said, adding that for other teams' fans - he mentioned the Chicago Cubs - that might not have seemed such an intolerable wait. The president said that the Yankees go into spring training each year "expecting to win at all," adding that "more often than not, you guys get pretty close." "Of course, if I had Rivera, I'd get pretty close, too," he added, to laugher. "My White Sox would get close every year." "For the millions of Yankees fans in New York and around the world who bleed blue, nothing beats that Yankee tradition: 27 World Series titles; 48 Hall of Famers -- a couple, I expect, standing behind me right now," said Mr. Obama. "From Ruth to Gehrig, Mantle to DiMaggio, it's hard to imagine baseball without the long line of legends who've worn the pinstripes. Last season, this team continued that legacy, winning 103 games and leaving no doubt who was the best team in baseball." He went on to hail a pair of Yankees -- Mark Teixeira and Jorge Posada -- for their off-the-field activities. Teixeira, he noted, set up a college scholarship in the name of a friend killed in a car accident, while Posada and his wife reached out to less fortunate families dealing with the same rare birth defect that affects their son. Mr. Obama also discussed Derek Jeter, who, he said, "still runs everywhere like he's trying out for the track team -- always setting an example, always hustling -- which is why I think everybody says that he epitomizes the best of the Yankee tradition." To play in "the pressure cooker" of New York, the president said, a player must be "poised and professional." "It takes somebody who appreciates how lucky he is, and who feels a responsibility for those who are less fortunate," he said. He pointed to the actions of manager Joe Girardi as well as the team's decision to visit recovering members of the military at Walter Reed Medical Center before coming to the White House. The Yankees, he said, show "every young person what it means to be a true professional." 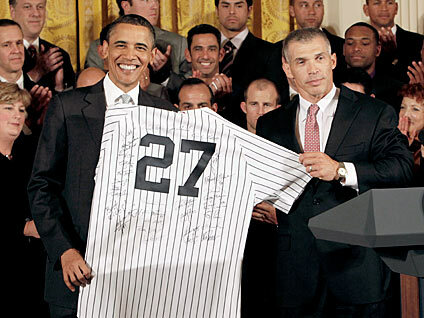 After the president spoke, Girardi presented him with a Yankees jersey signed by every member of the team. The president and the Yankees then posed for a picture with the World Series trophy; a woman in the audience could be heard yelling to the president that he better hold onto it, because he might not get another chance, prompting an "ooooh" from the crowd. "And you wonder why the other teams don't root for you," said Mr. Obama with a smile. He went on to shake hands with the members of the team. The event was held in the White House East Room because plans to have it outside were - yes - rained out. MORE: A-Rod Visits the White House: What Could Possibly Happen?